Creating Mini-beast hotels from recycled pallets. As part of the Tame Valley Wetlands Landscape Partnership Scheme, the Community Environmental Trust has enhanced an outdoor space at St. Gerards Primary School in Castle Vale, east Birmingham. Simon Lowe, Tame Valley Wetlands’ Training and Education Officer together with Sarah Oulaghan, Project Officer Community Environmental Trust created a “ Mini-beast hotel “ in the grounds of the school. The hotel was constructed from recycled pallets which were kindly donated by BMW at Hams Hall and was filled with various bits of material, both natural and manmade, which were collected from the local area and also brought in from home by the children. Ten children from the after-school eco club, came out and assisted with the construction of the hotel, with the idea being that it would provide an invaluable resource for future lessons involving insects, habitats and the environment, not to mention providing a home for an abundance of creatures ranging from insects, to amphibians and even hedgehogs. 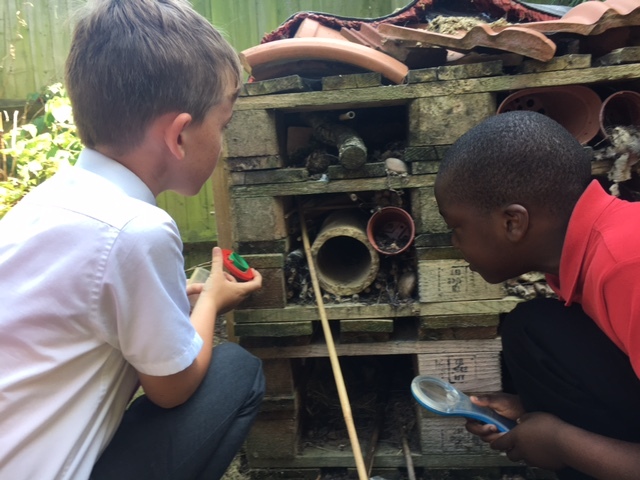 The hotel has been in-situ for almost a year and the children are already using the hotel to learn about the different species which live in their school grounds and are already getting to grips with identifying what they find. You can find out more about how you can help your local wildlife by visiting the Warwickshire Wildlife Trust website and clicking on the “ how to help wildlife “ page. Here you will find plenty of fun activities that you can do in your own garden. This entry was posted in Latest News, Projects on 9th October 2017 by Ian Wykes.